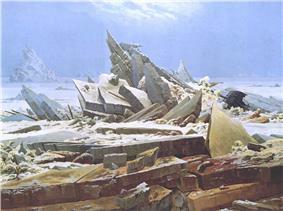 Friedrich's work brought him renown early in his career, and contemporaries such as the French sculptor David d'Angers (1788–1856) spoke of him as a man who had discovered "the tragedy of landscape". Nevertheless, his work fell from favour during his later years, and he died in obscurity, and in the words of the art historian Philip Miller, "half mad". As Germany moved towards modernisation in the late 19th century, a new sense of urgency characterised its art, and Friedrich's contemplative depictions of stillness came to be seen as the products of a bygone age. The early 20th century brought a renewed appreciation of his work, beginning in 1906 with an exhibition of thirty-two of his paintings and sculptures in Berlin. By the 1920s his paintings had been discovered by the Expressionists, and in the 1930s and early 1940s Surrealists and Existentialists frequently drew ideas from his work. The rise of Nazism in the early 1930s again saw a resurgence in Friedrich's popularity, but this was followed by a sharp decline as his paintings were, by association with the Nazi movement, misinterpreted as having a nationalistic aspect. 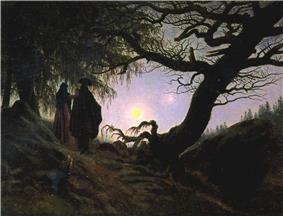 It was not until the late 1970s that Friedrich regained his reputation as an icon of the German Romantic movement and a painter of international importance. 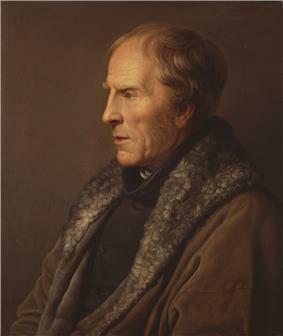 Friedrich began his formal study of art in 1790 as a private student of artist Johann Gottfried Quistorp at the University of Greifswald in his home city, at which the art department is now named in his honour (Caspar-David-Friedrich-Institut). Quistorp took his students on outdoor drawing excursions; as a result, Friedrich was encouraged to sketch from life at an early age. Through Quistorp, Friedrich met and was subsequently influenced by the theologian Ludwig Gotthard Kosegarten, who taught that nature was a revelation of God. Quistorp introduced Friedrich to the work of the German 17th-century artist Adam Elsheimer, whose works often included religious subjects dominated by landscape, and nocturnal subjects. 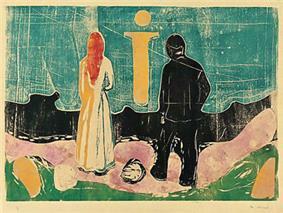 During this period he also studied literature and aesthetics with Swedish professor Thomas Thorild. Four years later Friedrich entered the prestigious Academy of Copenhagen, where he began his education by making copies of casts from antique sculptures before proceeding to drawing from life. Living in Copenhagen afforded the young painter access to the Royal Picture Gallery's collection of 17th-century Dutch landscape painting. At the Academy he studied under teachers such as Christian August Lorentzen and the landscape painter Jens Juel. These artists were inspired by the Sturm und Drang movement and represented a midpoint between the dramatic intensity and expressive manner of the budding Romantic aesthetic and the waning neo-classical ideal. Mood was paramount, and influence was drawn from such sources as the Icelandic legend of Edda, the poems of Ossian and Norse mythology. 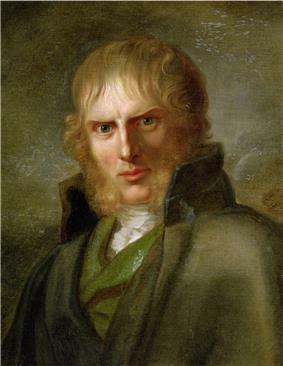 Friedrich settled permanently in Dresden in 1798. During this early period, he experimented in printmaking with etchings and designs for woodcuts which his furniture-maker brother cut. By 1804 he had produced 18 etchings and four woodcuts; they were apparently made in small numbers and only distributed to friends. 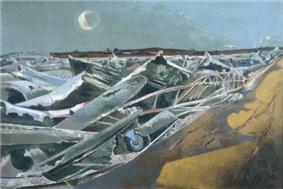 Despite these forays into other media, he gravitated toward working primarily with ink, watercolour and sepias. With the exception of a few early pieces, such as (1797), he did not work extensively with oils until his reputation was more established. Landscapes were his preferred subject, inspired by frequent trips, beginning in 1801, to the Baltic coast, Bohemia, the Krkonoše and the Harz Mountains. Mostly based on the landscapes of northern Germany, his paintings depict woods, hills, harbors, morning mists and other light effects based on a close observation of nature. These works were modeled on sketches and studies of scenic spots, such as the cliffs on Rügen, the surroundings of Dresden and the river Elbe. He executed his studies almost exclusively in pencil, even providing topographical information, yet the subtle atmospheric effects characteristic of Friedrich's mid-period paintings were rendered from memory. These effects took their strength from the depiction of light, and of the illumination of sun and moon on clouds and water: optical phenomena peculiar to the Baltic coast that had never before been painted with such an emphasis. Friedrich completed the first of his major paintings in 1807, at the age of 34. The Cross in the Mountains, today known as the Tetschen Altar (Galerie Neue Meister, Dresden), is an altarpiece panel commissioned by the Countess of Thun for her family's chapel in Tetschen, Bohemia. It was to be one of the few commissions the artist received. The altar panel depicts the crucified Christ in profile at the top of a mountain, alone and surrounded by nature. The cross reaches the highest point in the pictorial plane but is presented from an oblique and a distant viewpoint, unusual for a crucifixion scene in Western art. Nature dominates the scene and for the first time in Christian art, an altarpiece showcases a landscape. According to the art historian Linda Siegel, the design of the altarpiece is the "logical climax of many earlier drawings of his which depicted a cross in nature's world." Friedrich was acquainted with Johan Christian Clausen Dahl (1788–1857). 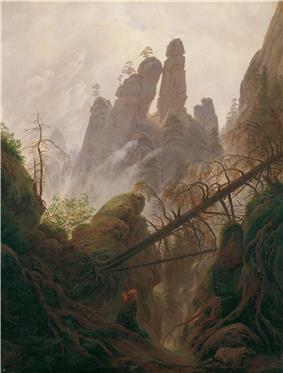 Dahl was close to Friedrich during the artist's final years, and he expressed dismay that to the art-buying public, Friedrich's pictures were only "curiosities". 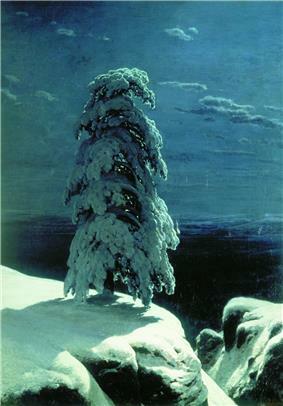 While the poet Zhukovsky appreciated Friedrich's psychological themes, Dahl praised the descriptive quality of Friedrich's landscapes, commenting that "artists and connoisseurs saw in Friedrich's art only a kind of mystic, because they themselves were only looking out for the mystic... They did not see Friedrich's faithful and conscientious study of nature in everything he represented". Caspar David Friedrich in his Studio (1819) Alte Nationalgalerie, Berlin. Kersting portrays an aged Friedrich holding a maulstick at his canvas. 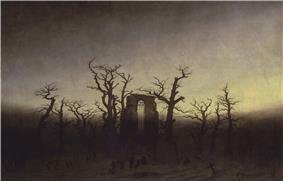 Bare oak trees and tree stumps, such as those in Raven Tree (c. 1822), (c. 1833), and Willow Bush under a Setting Sun (c. 1835), are recurring elements of Friedrich's paintings, symbolizing death. 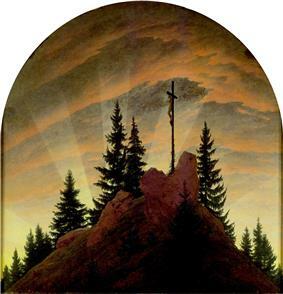 Countering the sense of despair are Friedrich's symbols for redemption: the cross and the clearing sky promise eternal life, and the slender moon suggests hope and the growing closeness of Christ. In his paintings of the sea, anchors often appear on the shore, also indicating a spiritual hope. 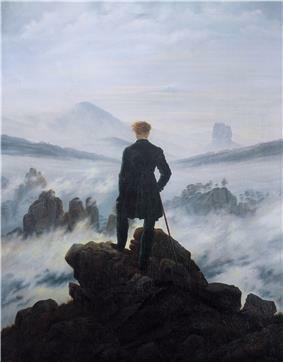 German literature scholar Alice Kuzniar finds in Friedrich's painting a temporality—an evocation of the passage of time—that is rarely highlighted in the visual arts. 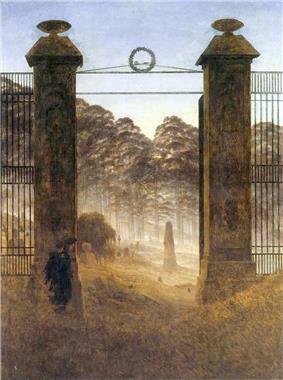 For example, in The Abbey in the Oakwood, the movement of the monks away from the open grave and toward the cross and the horizon imparts Friedrich's message that the final destination of man's life lies beyond the grave. In (1812), a dilapidated monument inscribed "Arminius" invokes the Germanic chieftain, a symbol of nationalism, while the four tombs of fallen heroes are slightly ajar, freeing their spirits for eternity. Two French soldiers appear as small figures before a cave, lower and deep in a grotto surrounded by rock, as if farther from heaven. A second political painting, (c. 1813), depicts a lost French soldier dwarfed by a dense forest, while on a tree stump a raven is perched—a prophet of doom, symbolizing the anticipated defeat of France. ^ Lüddemann, Stefan. "Glimpses of Mystery In a Sea of Fog. 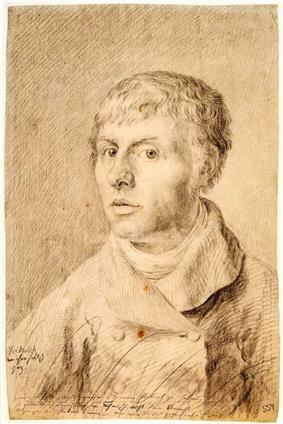 Essen’s Folkwang Museum reinterprets Caspar David Friedrich". The Atlantic Times (Germany), May 2006. Retrieved on 27 November 2008. ^ Gerhard Richter: A Life in PaintingDietmar Elger, (Chicago: University of Chicago Press, 2009), pp. 173-78. ^ Sabine Schütz, "Color-Space Bodies: The Art of Gotthard Graubner", Arts Magazine, Volume 65, April 1991, pp. 49-53. ^ Leach, Cristin. "Old Romantics Tug at the Heart". The Sunday Times, 24 October 2004. Retrieved on 16 November 2008. ^ See also, Geldzahler (1969), 353. Reproduction of the Rothko can be found here . 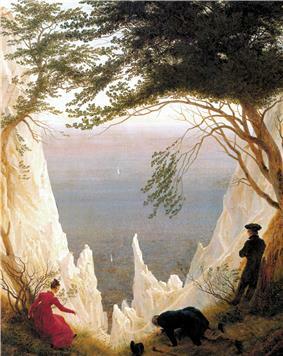 ^ "Caspar David Friedrich inventing romanticism". designboom.com. Retrieved on 21 October 2008.